Adrian Flux specialise in insurance for all types of vehicle, including converted campers, whether based on vans, coaches or buses. Our flexible insurance cover is affordable, and we believe it gives you the very best policy for the best price. 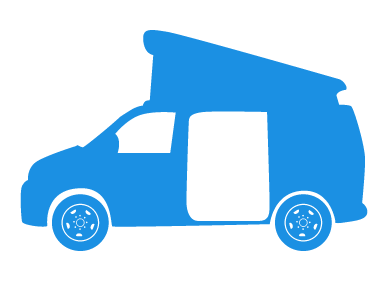 Our quotes compare a panel of insurers, saving you time and effort on your converted camper insurance quote. Converted campers come in all shapes and sizes, and whether you've built it yourself or had it professionally converted, we can help to find a policy for you. Adrian Flux offers self build campervan insurance and van conversion insurance policies to fit your needs. We provide cover for converted campers, vans, motorhomes, coaches and buses; as well as base vehicles, such as vans, buses, people carriers, ambulances and trucks. Whether you need converted American RV insurance, or a policy for a converted VW Splitty or Bay, Adrian Flux can help. With over 40 years of experience of insuring specialist vehicles, Adrian Flux is the insurance broker to choose for high quality, flexible and affordable converted camper insurance. We understand that the pleasure of owning a camper is about the lifestyle as much as it is about the vehicle, and our cover takes this into account. Our converted camper, coach and bus insurance policies include a free green card for European travel. We know that campervan owners like to get away, so some schemes allow trips of up to 90 days, or even longer, at a time. We can offer discounts of up to 15% if you belong to a recognised web forum or camper owners club. Whether your camper was professionally converted, or your own project, you need insurance that suits your vehicle. At Adrian Flux we understand the features that owners need from their converted camper insurance policy. Agreed value cover We know the hard work and money that goes into a self build or converting a campervan, and want your policy to reflect the vehicles true value. We can assess your camper, and any modified parts, and agree cover for its true value, so you won't get a nasty surprise if you need to make a claim. Import Camper Insurance whether you've converted a Californian, Mexican or Brazilian VW Camper, or imported a van to convert, we have a specialist policy for you. Limited Mileage discounts the fewer miles you drive, the more money you can save, from as little as 1,500 miles. Cover while you're converting. If your van is not fully converted we can still offer cover, giving you freedom to travel during the project. Contents cover depending on the policy taken, including gas bottles, awnings and personal effects. Owner's Club Discounts If you belong to a recognised owners club or enthusiasts' forum, you will receive a discount of up to 15%, depending on the policy taken. Our staff are all seasoned insurance experts and will calculate your premium individually, using their expert knowledge of the many specialist camper conversion insurance schemes on offer. Due to the type of vehicles insured, all our policies are designed especially for the out of the ordinary and our staff have a high degree of knowledge in this field. This is not an online quotation system using computer rates. Instead each risk will be individually calculated by our expert staff. Please note that our sales staff are insurance experts not just button pushers and along with our tailor made campervan insurance schemes we believe we offer the best quotation service around.